As some of you may know, there's been a whirlwind of events this week - some were good, some were bad - but it's important to keep moving on and celebrate the good things in life that we have been blessed with, alhamdulillah. On Friday, I felt that mixing prints and colours would be a great way to celebrate the end of the week so that's exactly what I did. I LOVE your skirt. And I could never get away with wearing stripes with that skirt and hijab. :) For some reason on you, it works! mashallah. Ramadan Kareem to you. That skirt is just gorgeous. The colours are so lovely. Wishing you a Ramadan Kareem from the Netherlands! i love the colours, the mish match of patterns totally works on you! Totally love the mix of patterns and the colors of your skirt are great! Ramadan Kareem! Greetings from Brazil! Wanted to wish you a ramadhan kareem. I probably won't be on the blogospher for a while, so enjoy this blessing month. 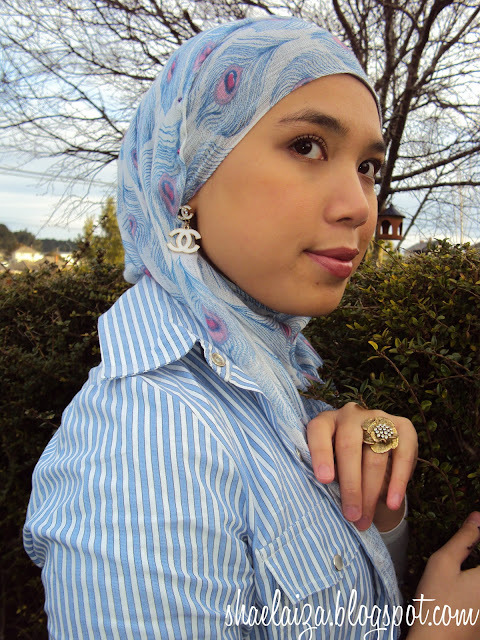 Khai, I bought this hijab from one of the shops inside Mydin, Subang Jaya. It's on the ground floor. Will be answering all hijab-related questions in a long-awaited post that is coming up this weekend inshaAllah! love that skirt on you! very pretty mA!